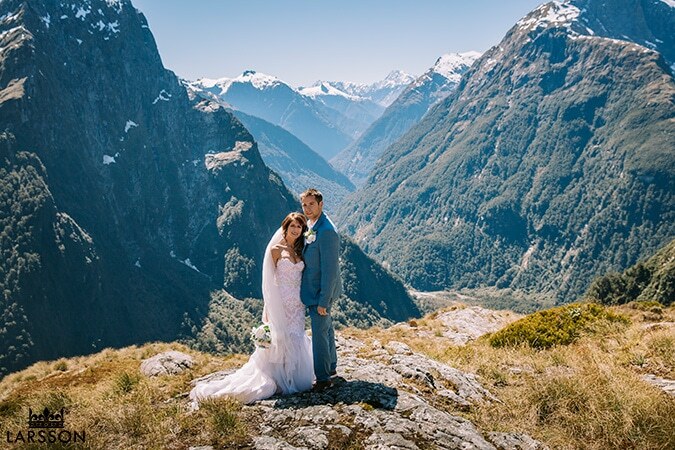 Jenny and Ryan came over from Canada for their Fiordland Wedding. They stayed at The Cottage at Stoneridge Estate. We did a first look by the lodge before heading out to the airport to meet the pilot and celebrant. It was a stunning day for it as we started our flight over the mountains. Fredrick was fantastic to work with! He was able to capture exactly the relaxed and natural style we wanted. He was down to earth, easy to work with, gave clear directions/ advice, listened to what we wanted, was timely and very professional. We organised our wedding from overseas and we always found the communication to be prompt and helpful. The pictures were absolutely stunning, capturing the essence of our wedding. We both couldn’t be happier with the whole experience (seriously) and highly recommend Larsson Weddings!